Found 3 file extension associations related to PFXplus and 3 file formats developed specifically for use with PFXplus. 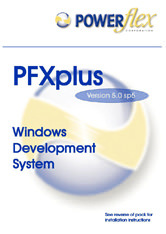 The PFXplus development System is the industrial-strength solution for the toughest application development problems. Now you get more tools to help you work smarter and deliver more and better software than ever before. If you need more information please contact the developers of PFXplus (Powerflex Corporation), or check out their product website.